The typical period used for the ATR calculation is 7. The multiplier is typically set at 3. Technician defaults to these parameters. You can also select colours upper and lower lines by selecting the appropriate box to bring up a colour palette. 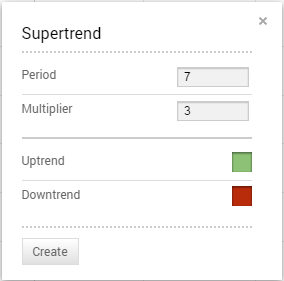 The supertrend indicator measures trend direction but not strength. It gives buy or sell signals when price crosses the indicator. In a sense, it is like a moving average and trailing stop hybrid. Since the indicator flips sides from above to below price action and back it adds an element of the parabolics stop-and-reverse for making the trade. The chart of Amcor shows a choppy period of trading in February 2014 that gave many supertrend false signals. In order to know about this condition, a trend identification indicator such as the Directional Movement System could be used. However, we can still eyeball that the market was rather choppy at that time. In the middle of the chart, the trend was established (we can use a trend line or support break to identify it) and a long position should be taken. Supertrend kept the long until just after the ultimate high and then flipped to a short. We can see how the green line below changed to a red line above.